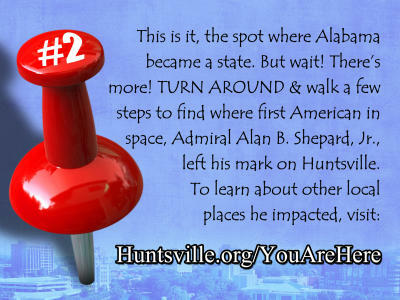 The Huntsville/Madison County Convention & Visitors Bureau (CVB) has placed 16 "push pins" around the city, and if you&apos;ve stumbled across this page, it means you&apos;ve probably already found one. So what are these, exactly? Each push pin (inspired by the universal map symbol for location) describes a little-known fact about that particular space. It could be a hidden Lucky Duck Scavenger Hunt duck, it could be the footprints of a famed astronaut, or it could be something else completely unexpected - but completely and uniquely Huntsville. For the full experience we encourage you to follow each clue on to the next location, but whether you find one push pin or all sixteen, we&apos;re glad you are here. Find all 16 You Are Here push pins using this map. &apos;Tis true! 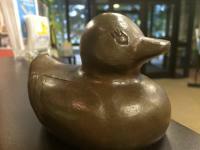 Ducks are plentiful in and around downtown Huntsville, but these particular birds of a feather have no choice but to flock together since they’re part of a year round 24/7 activity called the Lucky Duck Scavenger Hunt. But wait, there’s more! Make sure to plan a trip to Lowe Mill ARTS & Entertainment and visit the numerous talented artists in residence there including Everett Cox who designed these bronze beauties. Or, you can choo–choo-choose a similar adventure in adjacent Madison, Alabama called the Trains on Main Scavenger Hunt. These Alan Shepard boot prints are certainly a fascinating reminder of all the ways the U.S. space program has shaped Huntsville. If you thought these tiny treads were enough to recognize the contributions of the first American in space, that’s where you’d be wrong. Take time to explore the U.S. Space & Rocket Center for a “stellar” overview of all things “universally” associated with space. Conveniently, it’s located on a stretch of I-565 designated as Admiral Alan B. Shepard Highway. If you prefer your “star tours” slightly more literal, follow in those famous footsteps at a Von Braun Astronomical Society planetarium show. Arts Huntsville supports community creativity by advancing the arts, entertainment and culture to enrich Huntsville’s quality of life, education, and economic development. The best part? They do it in really funky and cool ways like the SPACES Sculpture Trail, the Huntsville Mural Map and events like LIT: Light+Innovation+Technology, Panoply, Concerts in the Park and many more. Pond dweller to patinated public art! Built in 1925, the Terry Hutchens Building has always been home to these perched-high polliwogs, but time takes its toll on all of us. Thanks to the talents of local Lowe Mill ARTS & Entertainment artist, Everett Cox, these now-bronze beauties have been given new life. Let’s not mince words, you’ve got some shopping to do! Take a short 15-minute drive east to lush Monte Sano State Park where you’ll find the Japanese Tea Garden, currently being brought back to its green thumb glory by community volunteers. Lest you think there are only trains to be found at the Historic Huntsville Depot, we are here to set you straight. Indeed there is a choo-choo or two, but you will also find the Erskine model Studebaker, a vintage fire engine and even a covered wagon. 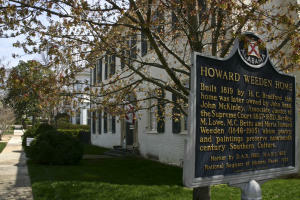 Burritt on the Mountain is excited to showcase the life and work of Huntsville artist Maria Howard Weeden, at the Burritt Mansion. Many of Miss Weeden’s stunning watercolor portraits are on display, along with additional watercolor and oil paintings, pencil sketches, illuminated poems, her four published books and copies of her poems in the historic regional black dialect. 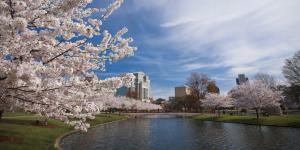 Burritt is proud to hold the largest publicly owned collection of her paintings. 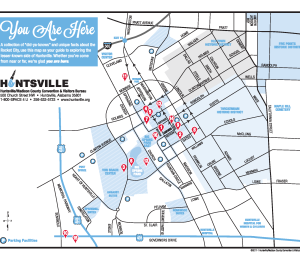 With ten locations to sip local craft suds all in one area, Downtown Huntsville, Inc. has conveniently laid out a trail to help you easily experience the breweries, taprooms, and beverage shops in the heart of the city. 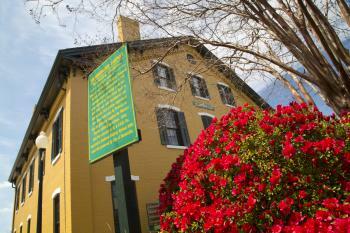 To participate, grab your Craft Beer Trail card at the Huntsville/Madison County Visitor Center or one of the breweries featured on the trail, including Green Bus Brewing. It’s been called “Huntsville’s Geekiest Stained-Glass Window” and for darned good reason! It certainly has quite the story to tell about Lowe Mill’s owner Jim Hudson, with an unapologetic hat-tip to his other passion HudsonAlpha Institute for Biotechnology. At first glance, HudsonAlpha may not seem like much of an entertainment destination. Think again! 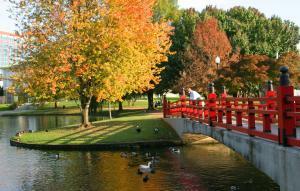 It’s worth the trip out to Cummings Research Park where, on the HudsonAlpha campus, you will find McMillian Park. You know, just a peaceful little park, birds, trees and pathways shaped like a giant DNA double helix. Clement Claiborne Clay (1816–1882), Confederate States senator, 1862 to 1864; formerly a U.S. senator. David P. Lewis (1820–1884), deputy to Provisional Confederate Congress (resigned after first session); later governor. LeRoy Pope Walker (1817–1884), first Confederate States secretary of war, 1861; also a Confederate brigadier general. William T. H. Brooks (1821–1870), Union brigadier general. Robert L. Spragins (d. 1964), Major general who commanded 71st and 44th Infantry Divisions in World War II. 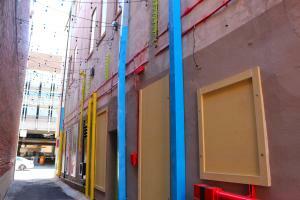 Public art is where it’s at and where it’s at is EVERYWHERE! Take a U.S. Space & Rocket Center bus tour to visit Marshall Space Flight Center, so named by President Dwight D. Eisenhower and later toured by President John F. Kennedy and President George H. W. Bush. Lowe Mill ARTS & Entertainment by Piper & Leaf Tea Co. If you’ve spent any time at all roaming around the halls of Lowe Mill ARTS & Entertainment the paint, song, prose part of this makes all the sense in the world. It’s the “little locomotion” we want to tell you more about. Did you know that just like our attention-ducking ducks of the Lucky Duck Scavenger Hunt in downtown Huntsville, the city of Madison has its own group of timid trains hiding around their downtown? Fun fact: Both were created by Lowe Mill’s own Everett Cox.